Win An ARCHOS 70 Tablet! | OhGizmo! If anything has risen to the top of gadget junkies’ “most wanted” list in the last two years, it’s been a tablet. While Apple’s iPad might have gotten everyone excited, the more affordable Android tablets are where it’s really at right now. Don’t believe me? Why not try one out for yourself? Don’t worry about paying for it, this one’s on us! That’s right, we’re giving away an ARCHOS 70 Internet Tablet this week. This awesome gadget features a 7-inch screen, 8GB of storage and is powered by Android. You’ll find features such as a 720p display, HDMI output, a built-in webcam, and an SDHC slot for extra storage. As usual, you’ll need to drop a comment below to win. However, we’re also going to need you to head over to the ARCHOS Facebook page and give them a “Like”. We will select a winner at random next Friday. Good luck! ← Announcing The Winners Of The Smartfish Whirl Mice! This would be pretty nifty, especially since I missed out on the HP touchpad fire sale. I would like one. Thx! If i had one of those it wouldn’t be so boring up at work anymore lol. If I win, I will taunt my Canadian neighbors. I am doing it already… IN YOUR FACE! But I don’t use facebook… how about a +1? The Age of the PC is slowly coming to an end…. As always, OhGizmo has the best swag to give away! Wow. This would be a epic win. Chris Scott Barr’s CAT let me be the choosen one once more …. Yeah buddy, wanting to buy one of these for a while, perhaps this will leave me with some extra money for motorcycle parts..
Ohhh, so nice. I wanna play with it! Ohhhh, so nice. I wanna play with it! Would be a great time waster on flights…. do want. These are great for the price. 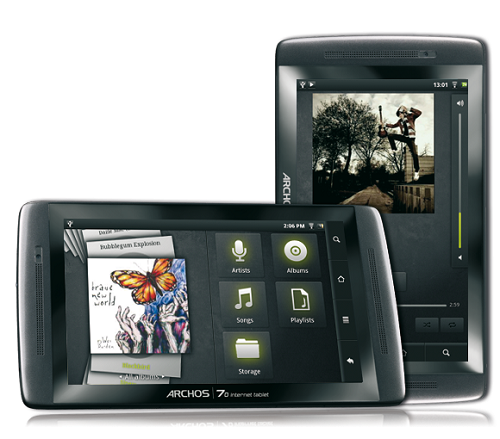 i will gladly taunt my non-ARCHOS-tablet bearing friends with this! i’d take one for a spin! I would love this! pick me please! Heck Yes Sign Me Up !! This tablet will bring my dead relatives back to life. I would use this as a cell phone. Loving Android and its FREE im in! I am so excited about this tablet! Can’t wait to get my hands on one! PICK ME!!! Wow, this would be awesome to have! Tablets are some sweet tech…OhGizmo always has the best giveaways! I gave them a Like. If you give me one I will change that to LOVE. I need a tablet since I got screwed on my HP Touchpad order. How much would I like an Archos? Way too much…..